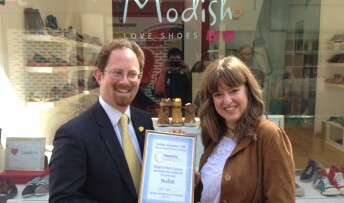 Successful shoe shop Modish in Green Street has won the May category ‘Best Clothing and Accessories Shop’ in Julian Huppert MP’s “Discovering Cambridge” competition, celebrating the city’s independent businesses. Modish opened in Cambridge in May 2011 and is run by Sarah Decent who describes the shop as being aimed at “women who like gorgeous looking footwear that don’t kill your feet or require a second mortgage”. Sarah also owns a second branch of Modish in Saffron Walden and runs a website and blog about her businesses. After visiting the shop on Monday 3 June, Julian commented “Although I wouldn’t claim to be an expert on women’s shoes, I was impressed by Modish and by Sarah’s obvious enthusiasm. It’s a lovely shop. One constituent described Modish as “an impressive, independent shoe shop, run by friendly, efficient and knowledgeable staff” adding that it was “always a pleasure to visit”. Runners-up in the category are the university and menswear outfitter A.E. Clothier on Pembroke Street and Rosie’s Vintage on Kings Street which specialises in vintage clothing and jewellery. This month Julian is asking for nominations for the best independent children’s shop. The category includes shops selling books, toys and clothes for children of any age. Nominations can be sent to Julian on Twitter @julianhuppert or Facebook, by email at julianhuppertmp@gmail.com or by post to Discovering Cambridge, Julian Huppert MP, 16 Signet Court, Swann Road, Cambridge, CB5 8LA.